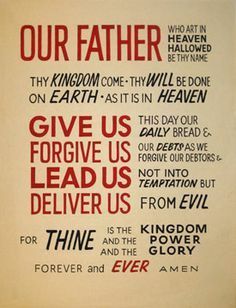 I hope you are all ready to dig a little deeper into the Lord’s Prayer today. Last week we covered the beginning of the prayer, ‘Our Father, who art in heaven, hallowed be thy name. Thy kingdom come, thy will be done, on Earth as it is in heaven.’ We broke each of these statements down and took a hard look at what we are really asking for when we pray those words. We discovered that there is a level of commitment required, and that the prayer required active participation. It’s a lifestyle. When we ask God to provide for us ‘our daily bread’ what are we really asking for? The story from Exodus illustrates one aspect of the concept for our daily bread. God’s people were upset with Moses and his brother Aaron. They were in the middle of the desert and there wasn’t any food around. God heard their cries and he said to Moses that he would provide quail in the evening and manna in the morning. By providing for the Israelites they would know that God was with them. “Give us this day our daily bread,” we pray in the Lord’s Prayer. It sounds simple enough and on one level it is quite simple. On another it is not. However, we look at it praying this prayer takes real faith. Daily bread is a common phrase in Scripture, whether in the story of the Exodus or as we find in Proverbs 30:8– “Keep falsehood and lies far from me; give me neither poverty nor riches, but give me only my daily bread.” The spirit of daily bread has been used by twelve-step groups of our era, with the admirable philosophy of life that says, “one day at a time”. In the prayer, we are asking God to provide for our needs as he sees them, a day at a time. However, does this prayer stop at the physical need for bread? Or is there something more. Bread was and still is a staple food. It represents the basic need for food that we all have. It could also refer to our necessities in general. We have been praying about the kingdom of God and the glory of God; yet here we are focusing on humanity. Is it just our food for which we are asking, or are we asking for more? Clearly, whether Jesus’ words here mean food specifically or other things in addition, his words imply our needs and not our wants. One way of looking at it is that Jesus is talking about bread, not peanut butter and jam! The question I would put to you, is should we be relying on God for our needs, as the ancient Israelites did? ‘Daily’ bread used to be a given, before the invention of refrigerators and freezers. Going to the market for food was a daily event. You could only keep food for a day or two before it would go bad. However, with modern technology that doesn’t happen much anymore. We have tended to lose the ‘dailyness’ of our reliance on God. Let’s examine these words a little closer; “Give us this day our daily bread.” It’s a collective request, one which regards the needs of not only the self but also of the community. But the real focus here is on the word ‘day’ as in today. We aren’t asking for tomorrow’s food, we are asking for today. But we’ve already acknowledged that there is more than just a request for food here. When we pray this prayer, we may consider that Jesus was encouraging us to ask for ordinary bread and for the bread of life, the bread of salvation. It boils down to this, when we pray “Give us this day our daily bread” we are acknowledging our complete and utter dependence on God. Well as the saying goes that’s easier said than done. Why? Well we tend to be fiercely independent people. We don’t care to admit that we are reliant on someone or something else. A large part of the population won’t even admit they were created by a Holy God. Which reminds me of a church sign, it read “God doesn’t believe in atheists, therefore atheists don’t exist.” Friends we tend to think of ourselves as self-made people, who have pulled ourselves up by our bootstraps and that our successes are the result of our own hard work. Giving is God’s delight. All he wants is for us to ask him! The Lord will provide for us. Do you believe in a God like that this morning? Do you believe that God will provide for every need you have, just as he did for the hungry, wandering Israelites? It takes real faith! I once heard a definition of faith that went, “Faith is taking a big frying pan and a camera with you when you go fishing.” During a drought, a country pastor called the congregation together to pray for rain. As he stood at the door greeting people he remarked with disappointment how little faith people had. Not one of them had brought an umbrella along. As a society we tend to walk more by sight than by faith. Our temptation is to do as the Israelites did and horde all the food. We don’t trust that God will provide our daily needs. We pray ‘give us this day our daily bread’ and then store a weeks worth. Now I’m not saying don’t save, and I’m not saying don’t prepare for the future. And I’m not talking about the amount of bread you have in the freezer. When we pray ‘Give us today our daily bread’ we are acknowledging that everything we have has been provided by God. If we take a different look at the prayer, suggesting that it deals with eternity. 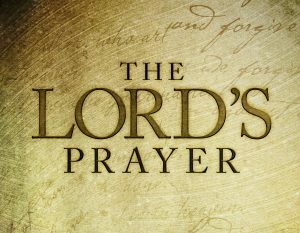 Then we could ask, “Do I believe that God has made eternal provision for me because I have prayed this prayer.” When we pray the Lord’s Prayer it is assumed that we are praying it with the knowledge of Jesus Christ as Saviour and Lord. “Give us this day our daily bread,” God desires to answer that prayer for each of us, for today, tomorrow and eternity. And answer it He will, when we trust his Son as Saviour and Lord. After all, not all our daily bread is food. Jesus said that we shall not live by bread alone, but by every word that proceeds from the mouth of God. God knows that our daily bread involves feeding on his word, the bread of life. God honours our prayer by giving us the daily bread of faith. When we pray these words we are submitting ourselves in total reliance to God and that friends is difficult. It’s difficult to give up total control in our lives. If you are starting to think that the Lord’s Prayer is a little more involved than you first realized, hold onto your pew. Let’s take a look at “And forgive us our debts as we forgive our debtors.” The passage we read from Matthew this morning illustrates the point rather well. This part of the Lord’s Prayer is perhaps the most difficult for us to accomplish for several reasons. The word ‘debts’ can have several other words substituted for it. The most common are trespasses and sins. Let’s talk about sin. We’ve all done it, we’ve all sinned. I don’t pretend to be without sin, and I don’t imagine any of us should. That is why we need to pray these words in the Lord’s Prayer. “And forgive us our debts as we forgive our debts.” None of us are immune to doing wrong in the sight of a holy God. For most people this is the hardest part of the Lord’s Prayer to pray. What it really says is this: ‘God deal with me as I deal with others.’ Our sins are those things we do wrong or fail to get right against God and others. Most items that we consider sins are covered by the Ten Commandments. Now, most of us do pretty well in that category. Our sins are those things we do that are outside God’s will. The Anglican Church’s general confession in The Book of Common Prayer puts it like this, “We have offended against thy holy laws, We have left undone those things which we ought to have done, And we have done those things which we ought not to have done, And there is no health in us.” That final phrase ‘and there is no health in us’ says how broken we are before God until we come clean and confess our sin before him. So it is when we pray the Lord’s Prayer that we ask God to forgive us in the same way that we forgive others. In our reading from Matthew Jesus ends by saying, “So my heavenly Father will also do to every one of you, if you do not forgive your brother or sister from your heart.” Those are some tough words considering what was said a verse earlier, where the master has the servant put in jail and tortured for not forgiving another servant as he had been forgiven. Receiving forgiveness is important. Without it, we can feel tortured or haunted by memories. Worse still, we can be separated from the fullest, deepest fellowship with God – that is, we can’t experience complete forgiveness until we repent. Repentance is what is required of us, whether asking the forgiveness of God or asking the forgiveness of another. Think about it this way. If I stepped on your toe and said ‘Sorry!’ and then I stepped on your toe again and said ‘Sorry!’, and then I stepped on your toe a third time and said ‘Sorry!’, how repentant am I? And how willing to forgive will you be? Real forgiveness comes about as the result of true repentance. Repentance literally means to turn around and walk the other way. It’s a 180-degree change. That’s what turning away from sin is all about. Until we are ready to repent, we keep God from working in our lives as deeply as he could. But the prayer says that we will be forgiven ‘as we forgive our debtors.” Literally, that asks God to forgive us as we have forgiven people who have messed up with us. In other words, we are asking God to forgive us in the same way, after the same manner, as we have already forgiven others. This is where it really gets hard! Each of us probably knows the phrase, “I don’t get made, I get even.” How does that look in light of the Lord’s Prayer? Yet, the effort at forgiving is energy well spent. As we forgive, we open the door to allow others to come to us for reconciliation. That is not always easy. To forgive is to cease to feel resentment against an offender. If you don’t forgive, you give your enemy power over you. We don’t like to believe that anyone except God has real power over us. But if we hold a grudge against someone, whether we realize it or not, that person really does hold power over us. We don’t want to be in contact with that person. We don’t want a confrontation, so we stay away from otherwise fun and interesting events because we want to avoid that person. Forgiveness does not concede defeat – the offender can still be wrong, and we can still forgive. Forgiving makes us more spiritually mature. Now the Lord’s Prayer doesn’t say anything about the atonement for our sins, because at that point the death of Christ had not yet occurred. Only then would the disciples realize that forgiveness from God was a free gift offered because Jesus dies on the cross and rose again to give us new life. All of this forgiveness is available to the children of God, disciples of Christ who will likewise forgive others who wrong them. It can be difficult, but if we are willing to forgive then in turn we will be forgiven by God. And the debt we owe God is far greater than any debt someone else might owe us. We owe God our lives, because for our sakes he gave the life of his own Son. One more thing, and it is a little thing: did you notice that this part of the Lord’s Prayer starts with the little word ‘And’? That links it to the previous statement, in which we ask God for our daily bread. When we think of our need for food, we should also think of our need to forgive and to be forgiven. We’ve tackled two of the toughest parts of the Lord’s Prayer, asking for our daily bread, recognizing our dependence upon God, and asking for forgiveness, as we would forgive. Two tough petitions found within the Lord’s Prayer. It’s a hard prayer when you break it down and consider what you are really asking for. And it should make us think twice before praying it. As you pray the Lord’s Prayer, make sure you’re ready to carry out the actions those words imply. It’s a tough prayer, but with God’s grace, it can come from our broken hearts and lips and impact us daily as we walk with God and other people. Amen.